To say that Japan loves its winter illuminations is as ridiculous an understatement as some of said illuminations are ridiculously over the top. And with between 700 - 800 illuminations switching on across Japan in the 2018 - 2019 winter season, choosing the biggest and best of these illuminations is a daunting task. So, let’s let someone else do it. In this case then we turn to the 6th Illumination Awards, organized by the Yakei Convention and Visitors Bureau and entertainment event company Pia Corporation, the winners of which were announced on November 13 this year. The annual Illumination Awards were decided by gathering the thoughts of over 5,000 night view fans, experts and industry insiders based on the previous season’s illuminations. The two main award categories are “General Entertainment” and “Illumination.” While the latter might seem to be the best barometer to determine the best illuminations in Japan, we’ve focused most of our attention on the former which would appear to reflect more those events that have embraced a philosophy of chucking as many light bulbs as possible at proceedings to come up with a delightfully bonkers experience that while lacking in, say, taste, is overflowing with pomp and hallucinogenic bravado. Something which is very typical of certain aspects of modern Japan, while being emphatically not Japanese. Confusing? Well, so is some of the thinking behind the following illuminations. And we've thrown in one or two of our own suggestions of the biggest illuminations in Japan for good measure. A note on the term “biggest” (最大級 / saidaikyu). In any genre of event in Japan, the term “largest” or “biggest” is thrown around pretty loosely and should be approached with a pinch of salt (often coming with quantifiers, qualifiers and caveats). Best just to assume that, whatever the event, it’s large. Everyone's favorite Dutch-themed theme park, Huis Ten Bosch, lights up winter 2018 - 2019 with its Kingdom of Lights extravaganza which organizers say is the largest illumination event in the world, boasting some 13 million lights. Whatever the number of lights, Huis Ten Bosch is No. 1 in the Illumination Awards “General Entertainment” category for the 6th consecutive year. That means Kingdom of Lights has been top since they started dishing out the award. 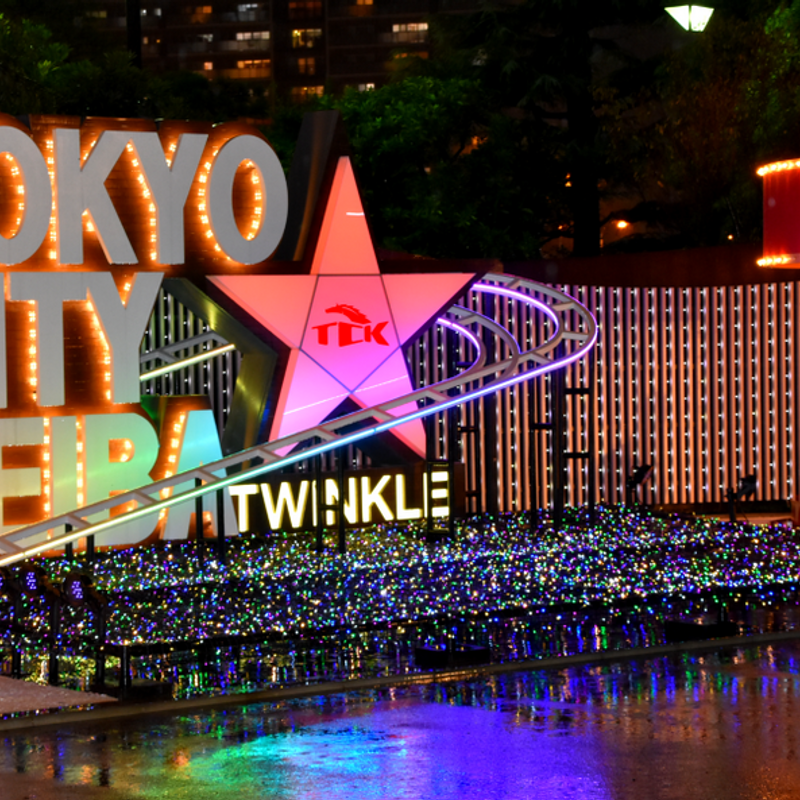 New to 2018 is the park's music, light and water show centering around an 85-meter-long fountain, itself the largest in Japan, and a canal parade featuring another fountain and, yes, yet more music and lights. Huis Ten Bosch illumination event features returning for another round of razzle, dazzle include the Art Garden, one of the best examples of Japan's strange fancy for napalming its flat spaces with garish blue lights. Fearing that this might not be enough, illumination creators at Huis Ten Bosch have added more blue lights to the lawn of blue lights, in the form of a "Waterfall of Light," 60 m in length and filled with, yes, blue lights. Other illumination spots include the 30-m-high Tree of Light, a street adorned with illuminated umbrellas, a moving, fire-breathing (real fire) robotic dragon, Japan's largest 3D projection mapping, an illuminated zoo, a rainbow garden (presumably swapping the tulip bulbs for light bulbs) and a ferris wheel (although such things are a bit bog standard these days). Much of the action can be viewed from the lofty heights of the Cafe Light Sky, which does look pretty magical, until you read the sobering caveat, "The floor is made of glass, so it's better for you to wear pants." Presumably the American kind on top of the British kind. As if all of this wasn't enough, included in the Kingdom of Lights arsenal at Huis Ten Bosch is Japan's largest Christmas market -- Shining Christmas. Where Huis Ten Bosch, Sasebo, Nagasaki Pref. Another staple on Japan’s illumination lists (as well as those that cover a broader range of attractions) comes Nagashima Resort’s Nabana no Sato (なばなの里) Illumination -- the one with Mt. Fuji recreated in lights, on a smaller scale, of course. Along with Huis Ten Bosch in Nagasaki this must be the illumination event in Japan scoring the most points for sheer scale and bravado having seemingly adopted that policy of throwing as many lights at the event as possible. Odd then that it didn't make the top 20 in the Illumination Awards "General Entertainment" category, but rather came in a No. 2 in the "Illumination" category. Still, organizers say that theirs is one of the biggest and best illumination events in Japan, and we're happy to take them at their word. You’ve probably Googled the images by now -- the above mentioned, season-changing Mt. Fuji, (35m high, 155 m wide), that 200m tunnel of brilliant lights, the other (shorter at 100 m) tunnel (which will this season be taking on the theme of “lavender”), and Japan’s largest illumination feature on top of water “Hikari no taiga,” the Great River of Lights -- 5m wide and around 120m long. Add to this season-within-the-season illuminations that cover autumn leaves, cherry blossom, and tulips, and in Nabana no Sato you’ve got a comprehensive illumination attraction that while lacking in subtlety certainly cannot be charged with coming short in scale. Oh, and we also like that confidence of the organizers when they say that the illuminations look even more beautiful on rainy days! Where Nagashima Resort, Nagoya, Aichi Pref. 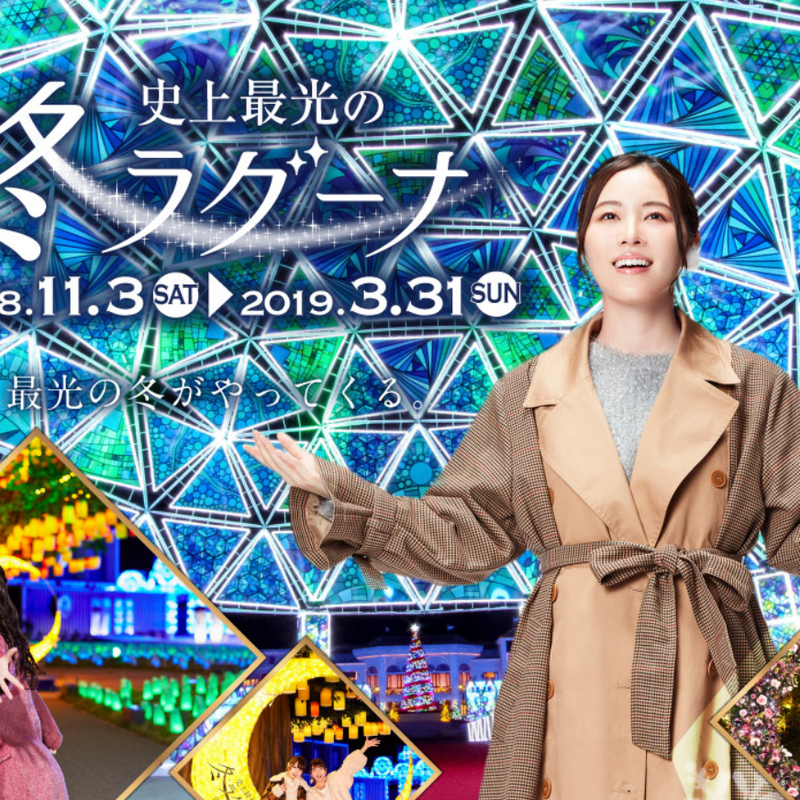 “A fantastic world of light and darkness awaits just one hour from the Tokyo metropolitan area,” so says the homepage of Sagami Lake Resort of its annual light-up extravaganza -- Sagami Lake Illumillium which came in a No. 2 in the Illumination Awards "General Entertainment." The same page also claims that this is the largest illumination event in the Kanto area, and while such superlatives seem open to loose interpretation and counterclaims, with some 6 million lights in play, covering the expanse of this amusement park / campground / BBQ area / resort, it’s certainly a biggie and was announced as one of the three main illuminations in Kanto at the Yakei Illumination Summit held in Sapporo in October. Illuminations at Sagami Lake have a kind of interactive element to them that includes walking through tunnels and seeking out animal figures. Japan enthusiasts will likely enjoy the cherry blossom-themed illuminations while kids (and movie fans) should get a kick out of the theme park’s illuminated Paddington Town. The requisite coating of flat(ish) areas with a carpet of blue lights is also in place at Sagami Lake Resort in the form of the Sea of Light (光の海). New features for the 2018 - 2019 season include a 15-m-tall Christmas tree and a kind of illuminated, floating snowman at the entrance. Where Sagamiko Resort, Sagamihara, Kanagawa Pref. This year’s Jewel of Shonan illumination will be the 19th outing for the show of lights on the popular island of Enoshima, southwest of Tokyo, if we include the event’s predecessor which was first switched on in November of 1999. The Enoshima illuminations are a regular fixture on lists of Japan’s best illumination events. October of this year saw the Enoshima event make a return to the list of the three major illumination events in Kanto (関東三大イルミネーション) along with Sagami Lake Illumillium (Kanagawa) and Ashikaga Flower Park (Tochigi). 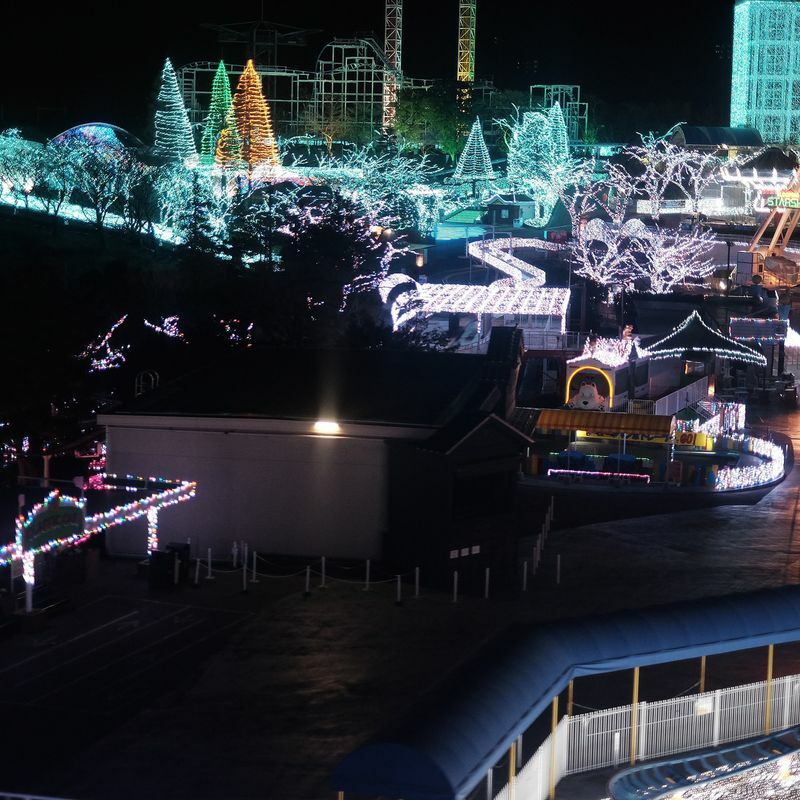 Shonan no Hoseki Enoshima took third spot in the Illumination Awards "General Entertainment." 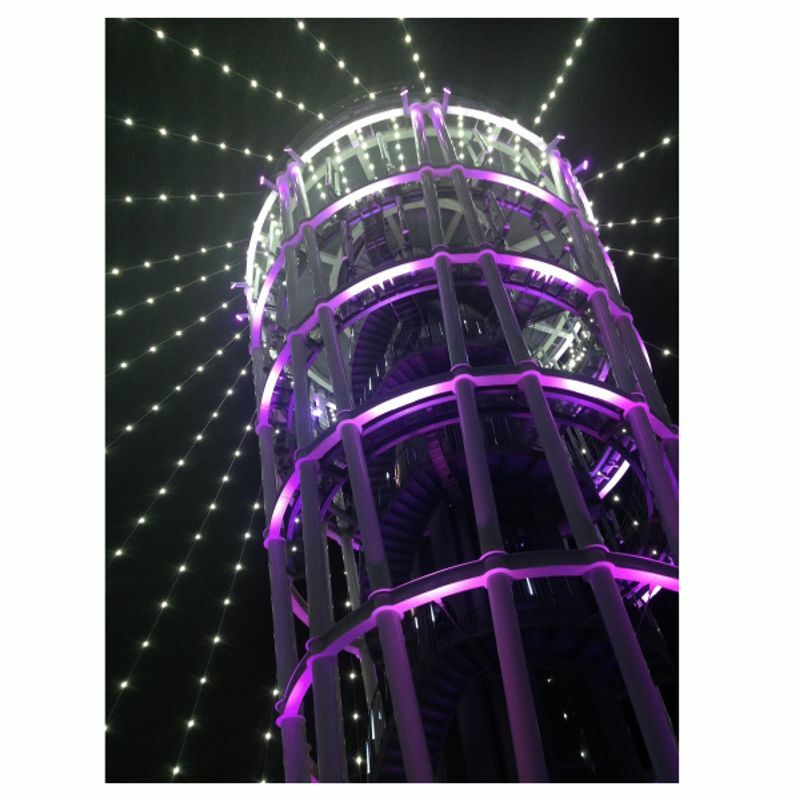 The Shonan no Hoseki Enoshima illuminations center on the 70-m-tall Enoshima Sea Candle tower from the top of which visitors are afforded a 360 degree view over one of the largest illumination displays in Japan, according to event organizers. Eyes will likely be drawn to those lights adorning the Enoshima Samuel Cocking Garden, a botanical garden established by British merchant Cocking in 1880. 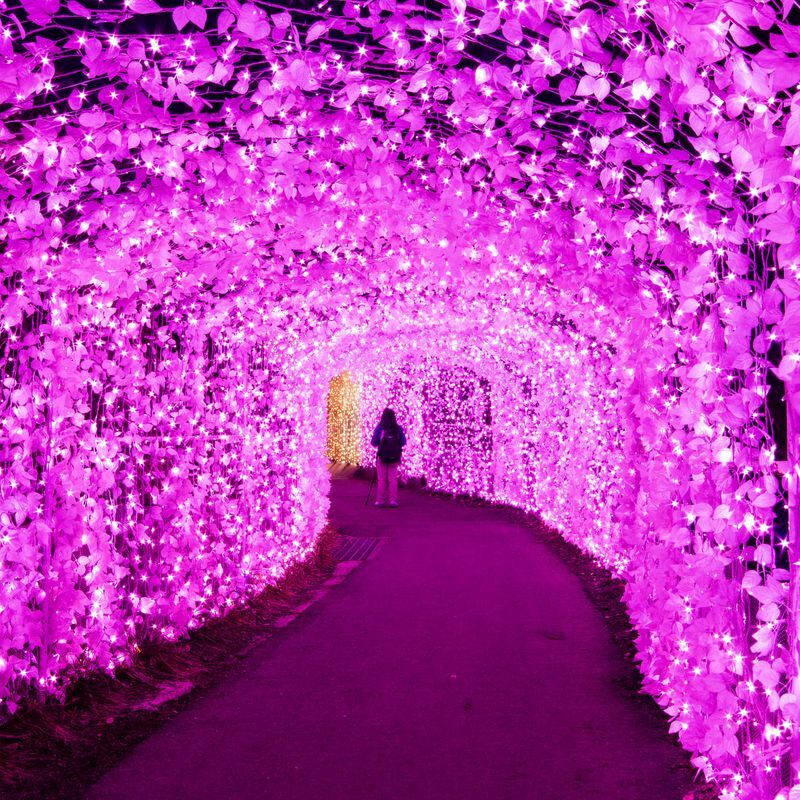 Other features of the event include a tunnel of lights from which are hung chandeliers made with Swarovski crystal, and the illumination of one of Enoshima’s “Iwaya” -- caves created by the eroding effects of the ocean. Expect the illuminations on Enoshima to be supplemented with concerts and special light ups within the main, err, light up! 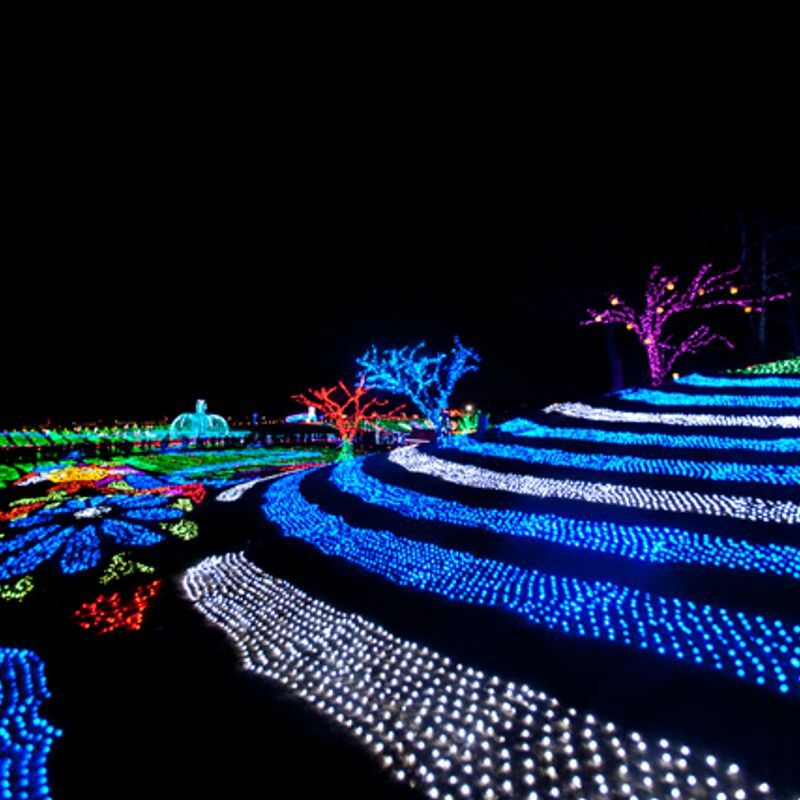 This amusement park in Kagawa Prefecture on the island of Shikoku is host to the largest illumination display in the central-west of Japan, boasting of around 2.5 million lights. It finished 4th in the Illumination Awards. A recommendation (イチオシ / ichioshi) from the event organizers for the 2018 - 2019 season is the Reoma Lantern World which looks to be a kind of art installation featuring some warmly-lit lanterns that appear as if floating up above. Lamps will also be used to (re)create another photo op spot in the form of scenes depicting Alice in Wonderland, a feature of the previous season. Perhaps one of the more unique features of Reoma Light World is a reproduction of the aurora lights, nature’s own illumination event that is most synonymous with the earth’s polar regions. Well, organizers at Reoma employ the latest optical tech to have a bash at laying on something similar above their theme park. Surely nothing if not ambitious! Firework display Legend of Hanabi Fantasia returns to proceedings but might seem humble when compared to the above. 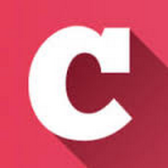 All in, there looks to be plenty going on at Reoma Light World which also includes 3D projection-mapping events Legend Palace and Magical Night, illuminated rides, Valentine’s attractions, and a large ferris wheel. 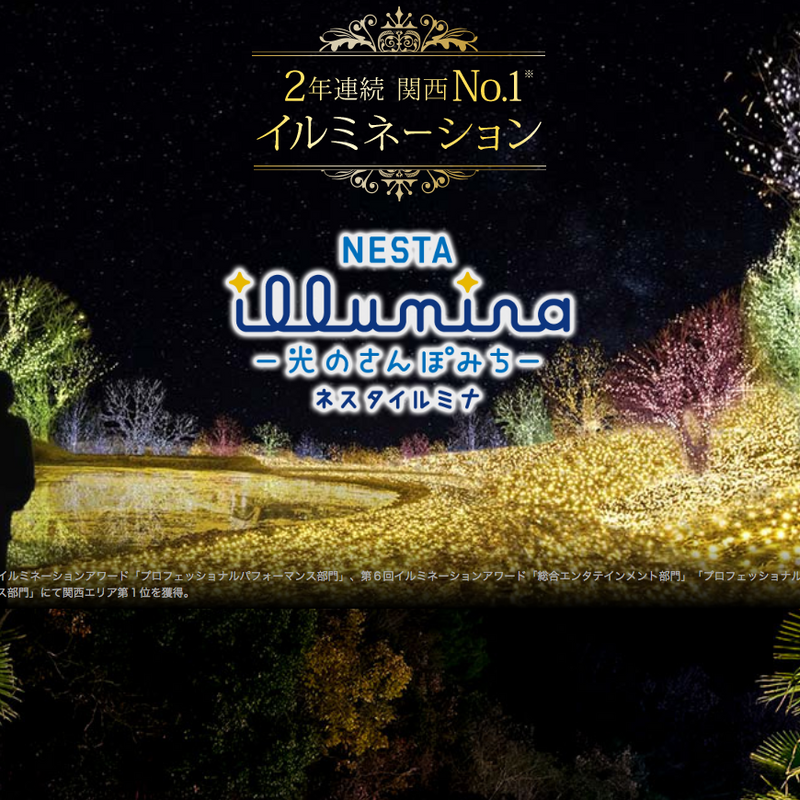 Entrance: Basic Winter Illumination Limited Tickets are 1,300 yen (adult), 800 yen (child). Free Pass tickets include ride fares - 1,600 yen (adult), 1,100 yen (child). Wide Free Pass tickets cover the form and entrance to Oriental Trip - 3,100 yen (adult), 2,900 yen (child). All of these tickets are for entry after 17:00 and for the periods Oct 27 - Dec 30 (2018) / Jan 1 - March 3 (2019). The 2018 - 2019 season will see the winter lights switched on at Tokyo German Village for the 13th time welcoming visitors to features that include a sound and light show, a 70-m-long illuminated tunnel, and some large-scale 3D illuminations. The overall vibe here looks to be more centered on the little ones with plenty of color and cute characters depicted in LED form coating the village’s lawns (that cover an area equivalent to 27 Tokyo Domes). Perhaps the event’s slogan of “The Power of Smile” says it all. Dating couples might want to head elsewhere. Where Country Farm Tokyo German Village, Sodegaura, Chiba Pref. 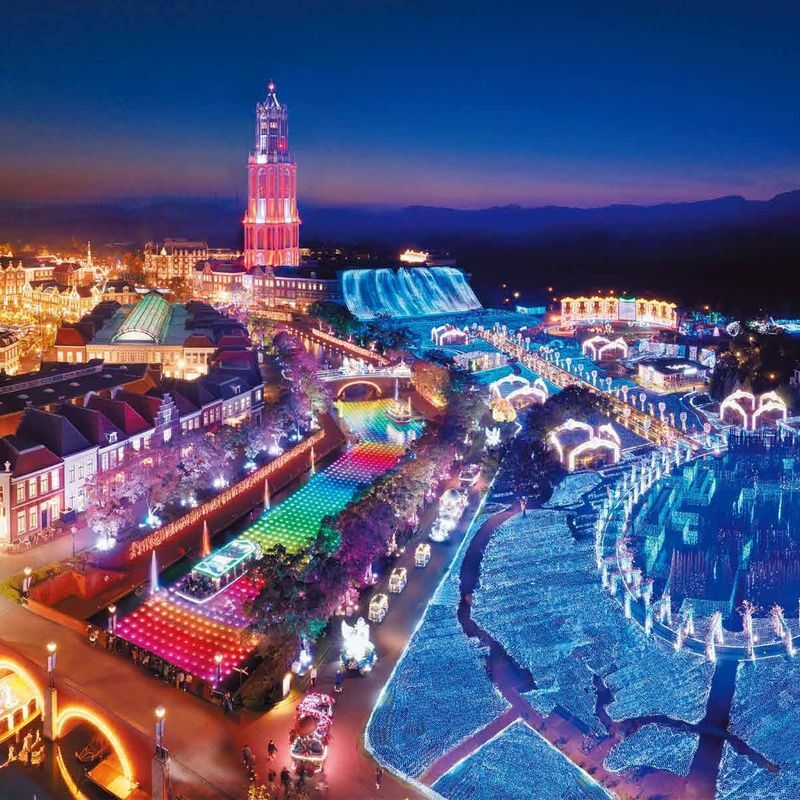 Water park by summer, illumination extravaganza by winter -- Tokyo-based theme-park mainstay Yomiuriland is certainly willing to adapt to the elements. In fact, management’s seasonal enthusiasm is such that trying to make sense of their 40 Stories of Jewellumination winter light up is almost as overwhelming as the number of lights they’ve employed (around 6 million) and one could make the case that the event’s homepage is in itself an extravaganza of not insignificant proportions. Still, whatever it is that’s on offer here (displays based around the theme and colors of gems), it looks impressive, covering eight areas of the park. We like the look of Area 2 - Tanzanite Promenade. Yes, we had to look it up, too. Tanzanite -- a rare blue / violet gem. What we have here is a 100m-long avenue bejewelled with lights in the tanzanite (and sapphire) hue, dotted with the occasional and contrasting classic colors of the rainbow, in a feature that employs around 400,000 lights in total. A more surreal experience might be in the form of popular park attraction “ev-Grand Prix,” the go-kart course getting the illumination treatment to lay on an experience that could be something like the 2008 Wachowski brothers (them of the Matrix fame) flick Speed Racer, only presumably with far less speed. Popular fountain show Diamond Aurora World returns again for the 2018 - 2019 season bringing the colors and vibe of those Arctic Circle skies that so fascinate. Kansai’s No.1 illumination event for two years running, according to the event homepage. This resort complex around 15 km northeast of downtown Kobe presents guests to its illumination event with five displays or themed areas which, in their totality, actually run a little contrary to the theme of this post, in that this is an illumination event which appears to be held throughout the year. Anyway, the lights are on in winter so we’ll go with it. First up, guests are dropped in at the deep end of the Japanese illumination experience with the “Dancing Wall,” a veritable rainbow of lights that would appear to offer a flamboyant contrast to the lazy palms that line the approach to the resort. And this is only the beginning. Having been fortunate enough to have visited the reduce-you-to-tears spectacular Iguazu Falls (straddling the border between Argentina and Brazil) we’re excited by the prospect of Nesta’s “Iguazu no Legend” feature. Organizers describe the illumination as combo of “LED Mega Vision,” “water screen projection,” and “deep bass sound equipment,” in what is a first-of-its-kind presentation for Japan. Whatever this means it’ll take some doing to even come close to the epic majesty that is the real thing, but we’ve got our fingers crossed nonetheless. For those that equate quality with numbers, Nesta’s “Wonder Tunnel,” -- a 220 m tunnel of light employing the use of some 1 million LED light bulbs -- looks like it could be one to watch. All in, the NEST Illumina features five areas of illumination dazzle and placed 8th in the Illumination Awards. Where Nesta Resort Kobe, Miki City, Hyogo Pref. Still, here we are at Aichi’s premier amusement park, Laguna Ten Bosch which, according to management, receives some 3 million visitors annually. The parks illumination event, Laguna Illumination Collection (10th in the awards), encompasses a number of light-em-up attractions one of which is new to the 2018 - 2019 season, the Hikari Promenade which, contrary to our common understanding of a promenade, actually features domes sitting on top of water. Rather spectacular is the Blue Palace (青の宮殿), a kind of marine-blue, immersive walk-in experience, while a series of 12 illuminated arches covered in more than 1 million lights appears to meet the impressive stats requirement that falls on Japan’s illumination events. The SNS worthy photo / selfie spots are all in place at the Laguna Illumination Collection and a special “Couple Ticket” would appear to show a bit of romantic savvy on the part of event organizers. 3D projection mapping and Christmas shows round out the winter illumination experience at Laguna Ten Bosch. Where Laguna Ten Bosch, Gamagori, Aichi Pref. The artery of central Osaka, Midosuji Boulevard runs north-south between the booming districts of Umeda (north) and Namba (south). From early November to the end of December the boulevard is bedecked with bulbs to form a 4 km-long light fantastic that in 2015 got itself a world record for the most roadside trees illuminated - the Mido-suji Illumination. This year marks the 10th year of the illumination, itself part of the broader Festival of Lights in Osaka 2018 which came in in 12th spot on the Illumination Awards. Festival proceedings this season in Osaka then include the Osaka Hikari-Renaissance with organizers having put together a program of illumination events to take advantage of the waterfront of Nakanoshima, the river island about 1 km south of Osaka Station. 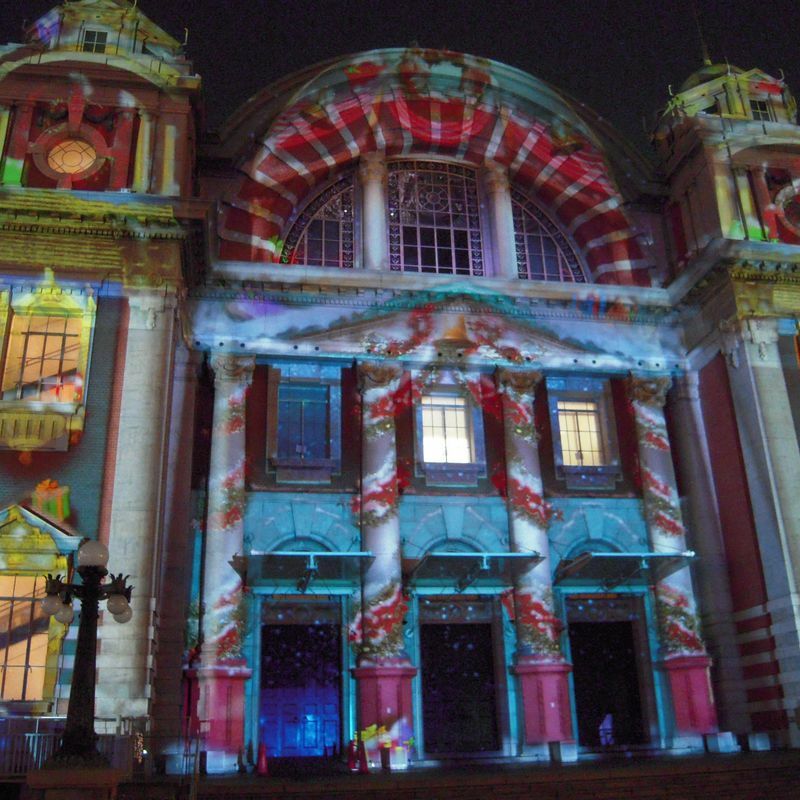 To mark the 100th anniversary of the Osaka City Central Public Hall the iconic structure will be the object of the Wall Tapestry Lighting Show, while riverside park welcomes once again the Tainan Temple Plaza of Lights where around 1,000 lanterns bring the Taiwanese festival vibes to downtown Osaka. A new addition to the Tokyo winter illumination scene, the people at horse racetrack Tokyo City Keiba (aka Oi Keibajo) brings us what they say is the largest illumination in the Kanto area. Tokyo Mega Illumi took out the New Illumination Award year’s, err, Illumination Awards with a light up feature consisting of around 8 million lights. The theme brings together horses, people and culture as it gives nods to the past, present and future of the Japan capital through state-of-the-art tech. Actually, this is an extensive set of illuminations dotted throughout the large facility in central Tokyo. Perhaps the main feature of Tokyo Mega Illumi is the “Terrace Illumination” coating a vast area in the center of the racetrack itself, adopting the curves of rice paddy as often seen in Edo era art. 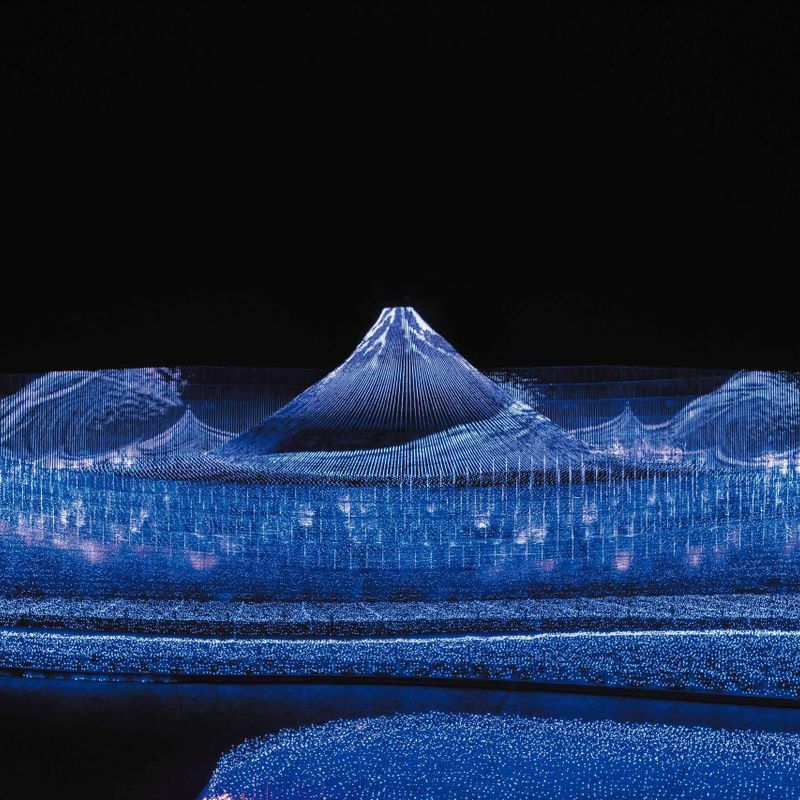 Another installation, The Genfukui, is what the creators say is the world’s first attempt to recreate a rural landscape in lights. A maze of Meiji prints, a Taisho era inspired light garden, and the recreation of an Edo era castle town offer further retrospection in what appears to be an interesting and thoughtful set of illuminations that you might not have expected to find at a horse racing track. 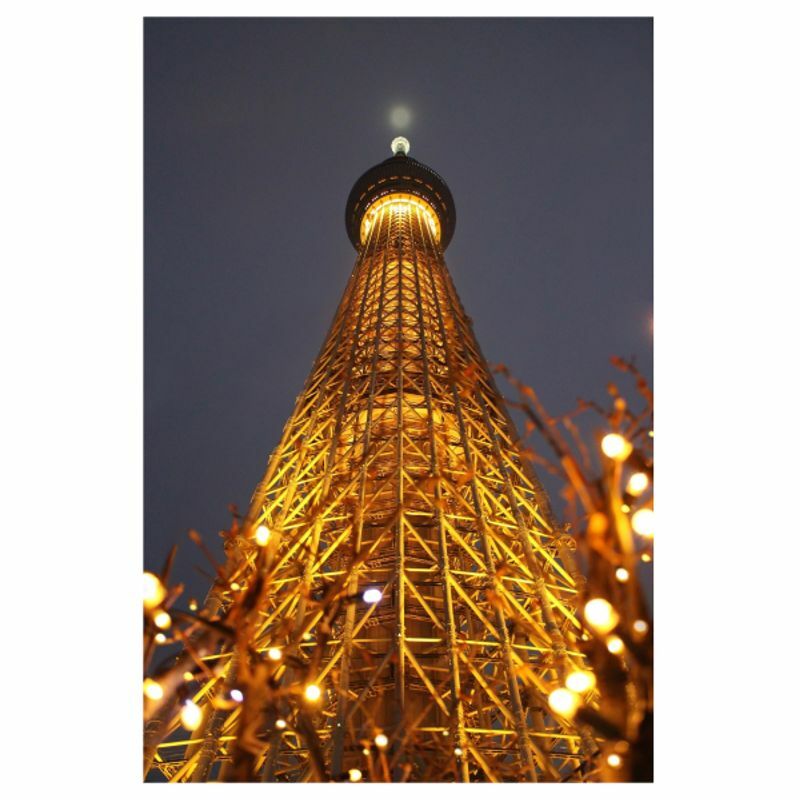 In 8th place on the Professional Performance Department Award, the illuminations around Tokyo Skytree make our list of the biggest and best illuminations in Japan because scale comes here in the form of the world’s tallest tower which takes its place as a target for a display of projection mapping. It’s perhaps unfair really, when you’ve got the tallest tower in the world at your disposal you’ve got a head start over the competition already. 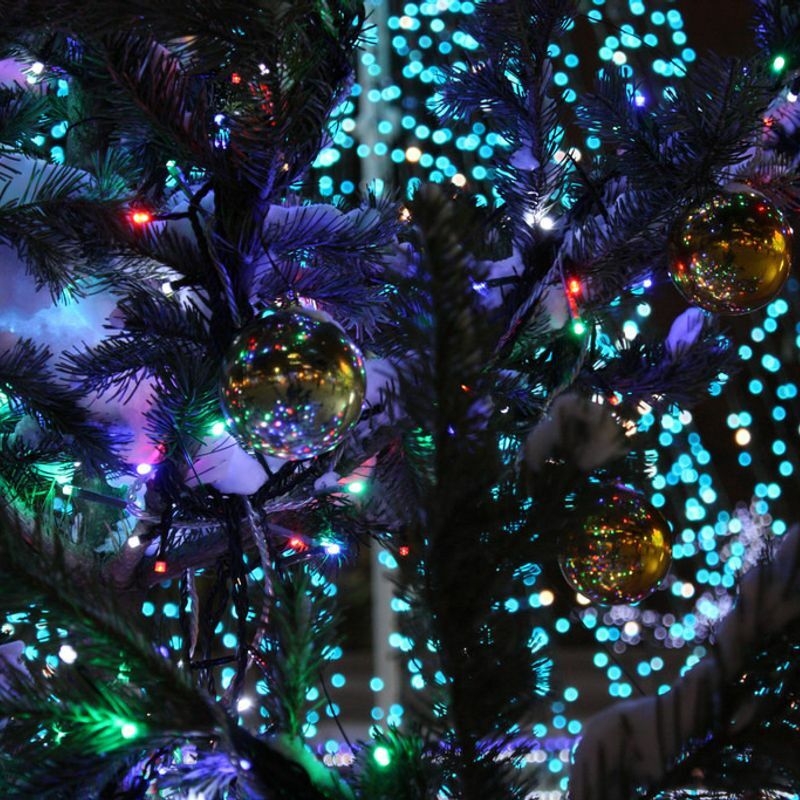 The theme for the 2018 illuminations at Tokyo Skytree is “Colorful Christmas” with organizers employing over half a million light bulbs for the illumination. And while an 8m tall Christmas tree is still minuscule compared to the OTHER tree, it’s still an upgrade from previous years. Skytree Town (the foothills of Tokyo Skytree, if you will) has laid on projection mapping displays each year now but 2018 sees a return after a two-year absence of using Skytree itself as the target object of said mapping, with organizers having put together a display that makes use of the structure’s impressive height. Tokyo Solamachi completes the set up with a German market and a variety of events. 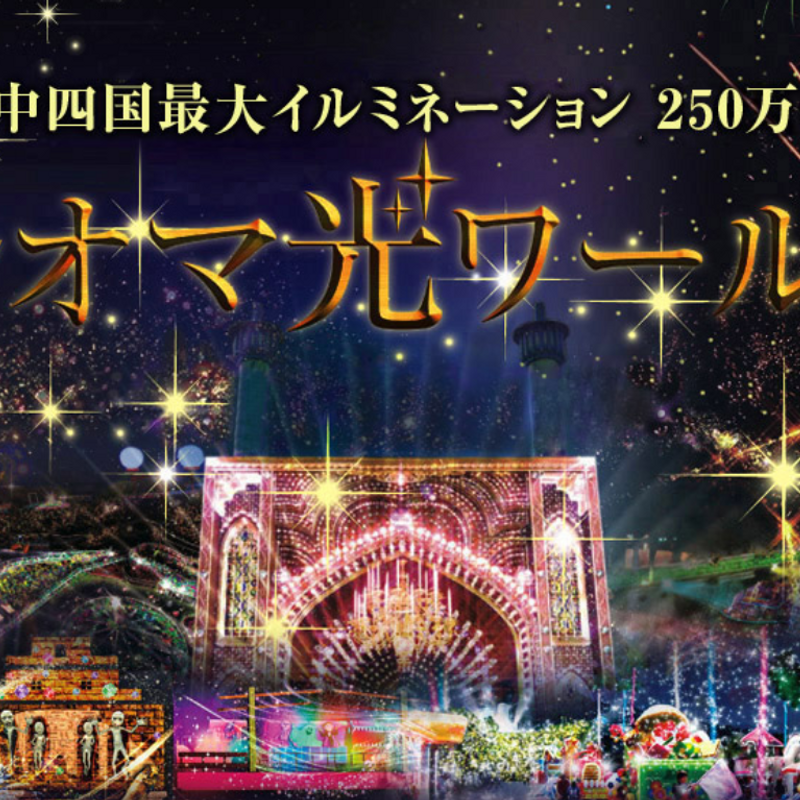 OK, so this illumination event is nowhere to be seen in this year's Illumination Awards but Kyoto-based electronic parts manufacturer Rohm Semiconductor brings to Japan’s ancient capital what they describe as a “circus of light” and the largest illumination event in town. As well, they might. The “Rohm Illumination 2018 (ロームイルミネーション2018) decorates the vicinity of the manufacturer’s offices with some 860,000 light bulbs. Of course, when you’re including the company name in name of the illumination display you’re opening yourself up to cries of shameless self-promotion, and even more so when said display is being held around the company building -- in Ukyō-ku, a couple of kilometers northwest of Kyoto Station. Features of the illumination include the Yamamomo no Ki -- two of the distinctive “mountain peach” (Myrica rubra) trees alight with the symbolism of everlasting love (white LED lights in this case). The Promenade of Light (光のプロムナード) -- a glittering, dazzling avenue of light created by the lighting up of each branch of the row of metasequoia trees lining the sidewalks of Kyoto’s Sai Dori. Cocktail Garden of Light (光のカクテルガーデン) -- A new feature of the illuminations this year, this one-meter high bar is studded with LEDs, looking out over a lawn itself garnered with lights. Illumination organizers say that 100% of the power used for the event is of the green kind and and CO2 emissions will be (have been) offset through community projects. We feel that this is more of an honorable mention, rather than a definitive stamp of biggest and best approval. Still, with features such as the “Love Tree, ” “Blooming Fountain,” and “Jewelry Palace” bringing the bonkers bling to the city’s Odori area, and street side light ups along Ekimae Dori and Minami 1-jo Dori, among others, bringing a more traditional illumination romance to proceedings the Sapporo White Illumination is to be taken seriously. Plus you’ll get the snow to boot! And then there’s the small matter of the Sapporo Snow Festival to follow! 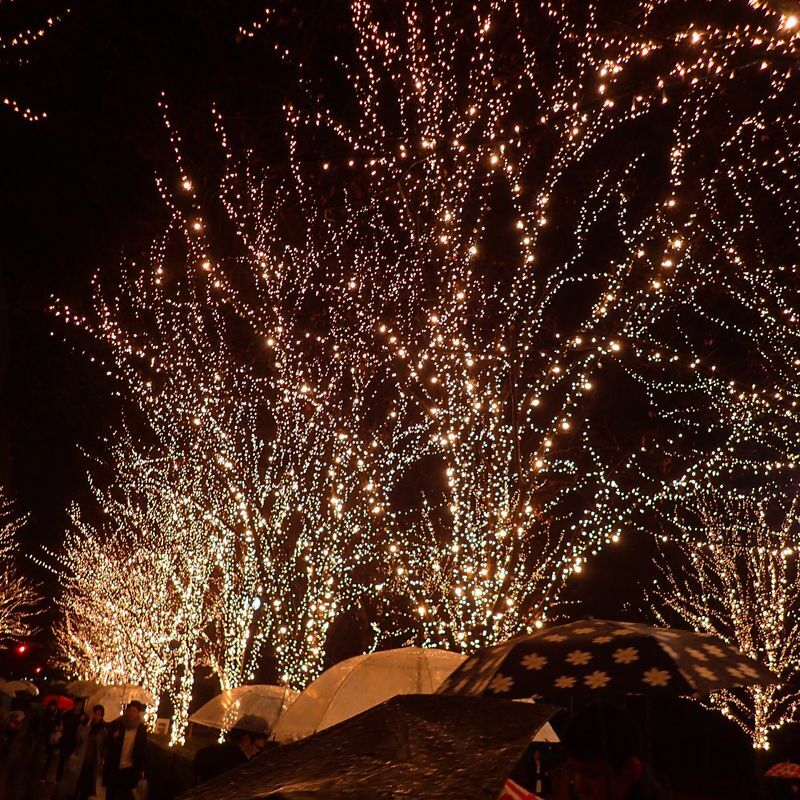 Of course, this list of Japan's winter illuminations is by no means comprehensive. In fact, there are probably some gaping absences. But hopefully it will get the ball rolling, so to speak. Winter illuminations in Japan 2017 - 2018: The classy ones! What do you think are the biggest and best winter illuminations in Japan? Let us know in the comments.